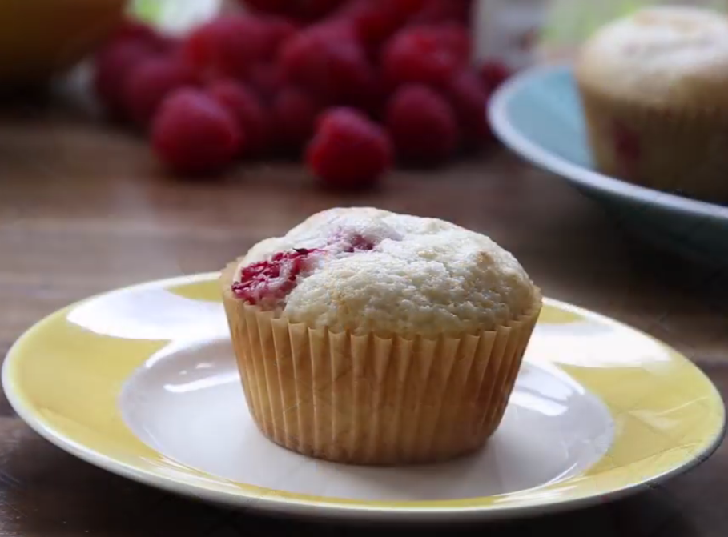 Homemade muffins packed with raspberries – a delightful breakfast made using all-purpose flour. You can make these fluffy raspberry muffins bursting with fresh berries picked straight from your local berry farm or with a bag of frozen raspberries from your grocery store. Either way, these Homemade Raspberry Muffins will be a hit. Preheat the oven to 180ºC / (350ºF). Line muffin tins with paper liners. In an electric mixer, beat on medium speed the eggs, the lemon zest, and the sugar until obtaining a homogeneous mixture. Reduce the mixer speed to low, add the flour mixed with the baking powder and beat until a creamy and homogeneous mixture. Add the raspberries and fold with a spatula.